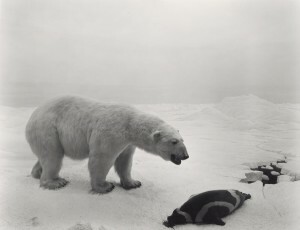 Based in both New York and Tokyo, Sugimoto studied photography at the Art Center College of Design in Los Angeles in the 1970’s. His work investigates themes of the transience of life, and the conflict between life and death. He sees photography as fixing or marking time, and develops work in series over many years. These include: Seascapes, Theaters, Dioramas, Portraits (of Madame Tussaud’s wax figures), Architecture, Colors of Shadow, Conceptual Forms and Lightning Fields. ‘Dioramas’ is a series that began in 1974, when he visited the American Museum of Natural History in New York, and began taking images of the animal displays. They give the illusion that these are real animals in their natural habitat, making us question what we actually know to be true. In 1975, he began ‘Theaters’, a series of American movie theater interiors and drive-ins. Portraits, shows a series of historical and contemporary wax figures such as Henry VIII and his wives, Shakespeare, Elizabeth I and Yasser Arafat. Presented life-size, these portraits of historical figures blue the line between an actual portrait, and an image that has changed from a painting to a waxwork to a photograph. He is known for his luminous ‘Seascapes’ (1980-) made at first or last light with an immense box camera, taken all over the world. The horizon line of the sea and sky line up perfectly across the entire series, giving a sense of connectiveness across the globe. He takes a great deal of care, printing his photographs to give a tonal richness within the blacks, whites, and grays. In recent years, his work has become increasingly abstract, as he experiments with blurring the images. He has been busy designing and building his own museum, the Odawara Art Foundation, due to open in the spring of 2016. Photography is a time machine, in a way, to preserve the memory, to preserve time. I made a curious discovery. The stuffed animals positioned before painted backdrops looked utterly fake, yet by taking a quick peek with one eye closed, all perspective vanished, and suddenly they looked very real. I’d found a way to see the world as a camera does. However fake the subject, once photographed, it’s as good as real. My standard style is sharp photographs, but recently I’ve been experimenting with intentionally out-of-focus shots. I set up the position of the film and lens of my camera so that the focal point is twice the point of infinity. Of course, this is very technical and impossible, but I can set my camera this way and it becomes an ideal only the camera can see, so the result is that nothing is sharp. It’s very painterly, and I don’t know how much further I can go with it. To get the powdery sea effect in “North Atlantic Ocean – Cape Breton Island” , Sugimoto hauled his American-made, wooden cabinet Durdorf and Sons camera out to Newfoundland, mounted it on a French tripod, screwed on a Carl Zeiss lens, loaded an 8×10 sheet of Kodak Plus-X 125 ASA film and then put a 16x neutral density filter on the unwieldy apparatus to reduce the film’s sensitivity to well below one ASA. “That’s like the speed of 19th C. film, when photography was invented,” he explains. When satisfied with light and composition, he tripped the shutter and waited one and a half hours for the seascape image to burn itself onto the film. He has a wonderful way of blurring reality with abstraction, moving across time to capture something about our world that is a fiction. His images are incredibly clever, and compelling.